What Are Your Wedding Planning Pain Points? Are you ready to plan an amazing wedding without the stresses that come along with it? Let us help you in 2018! Win a pamper kit and personal wedding concierge consultations with Poonam of The Maharani Diaries! 1. Information on how to enter forms part of the terms of entry. Entry into the ‘What Are Your Wedding Planning Pain Points’ Competition’ (“Competition”) is deemed acceptance of these terms and conditions. 2. Entry is open to residents worldwide who are 18 years of age or older at the time of entry. Entrant must be getting married or their entry may be deemed invalid. 3. The competition commences on February 14, 2018 and closes on April 15th, 2018. The winner will be announced on Monday, April 16th midday (UK/IRE time). a. Provide their name, postal code, email address, wedding date and date of birth. b. Be engaged or in the process of planning their wedding. c. Answer 10 questions about their wedding planning. d. By participating in this survey, you will automatically be opt-in to receive email updates from The Maharani Diaries. You must remain a current subscriber of the database in order to qualify to be a winner. 6. It is free to enter this competition. 8. A limit of one online entry for the life of the competition per person applies. 9. In consideration of the promoter awarding the prize to the winner, the winner hereby permits the winner’s name, entry, image and/or voice or comments, as recorded or documented and/or photographed during the winner’s participation in the prize to appear in connection with The Maharani Diaries or the advertising or marketing thereof, in any media whatsoever throughout the world and the winner will not be entitled to any fee for such use. 10. The prize winner will be notified by email within four (4) days of contest completion date and the winner’s details may published on the The Maharani Diaries website, Instagram, Twitter or Facebook page. 11. An entry that is made on behalf of an entrant by a third party will be invalid. 12. The winner has 72 hours from the date of notification to accept their prize. After this the prize may be awarded to another entrant. We reserve the right to disqualify or not award a prize to an entrant who in our opinion has not entered in the spirit of these terms and conditions or the intention of the competition. 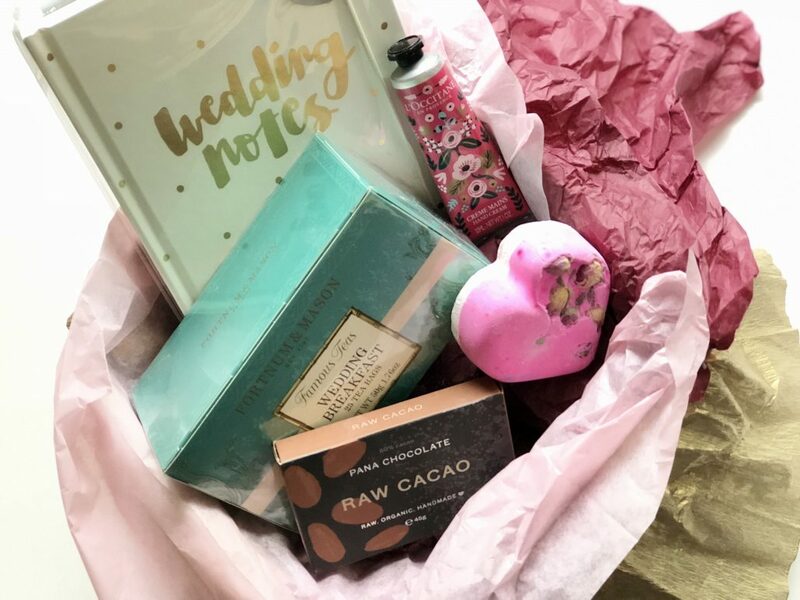 A pamper kit for the blushing bride to be along with free personal wedding planning consultations with a team member of The Maharani Diaries. Note that this is not a wedding planning service. The bride to be will receive advice and ideas on how to plan her wedding and The Maharani Diaries will personally reach out to vendors on behalf of the bride. 14. The total Prize Pool is valued at up to $150 (including GST). The promoter accepts no responsibility for change in prize value between now the ultimate prize redemption dates. 15. Any ancillary costs associated with redeeming the major prize are not included. These are the responsibility of the winner. 16. All prizes are non-transferrable. Prizes cannot be used in conjunction with any other special offer. Prize values are in Australian dollars. The Promoter accepts no responsibility for any variation in the prize values. 17. The promoter is neither responsible nor liable for any damaged, delayed or lost in transit in the delivery of the prize. 18. It is a condition of accepting the prize that the winner must comply with all the conditions of use of the prize and the prize supplier’s requirements. 19. Personal information about all prize winners will be shared with the prize provider, and their agents, to the extent necessary for prizes to be delivered to the prize winners. 20. Prizes will be awarded to the person named in their contestant entry. Should an entrant’s contact details change during the competition period it is the entrant’s responsibility to notify the promoter. A request to access or modify any information provided in an entry should be directed to the promoter. 21. Should the prize winner not meet any of the criteria stated in these terms and conditions to be a valid winner they will forfeit all rights to the prize, and a redraw will take place to reallocate the prize to a valid winner. 22. By accepting the prize, the winner agrees to participate in and co-operate as required with all reasonable media editorial requests relating to the prize, including but not limited to, being interviewed and photographed, filmed and/or chaperoned throughout the duration of the prize. 23. If for any reason this competition is not capable of running as planned, including due to infection by computer virus, bugs, tampering, unauthorised intervention, fraud, technical failures or any causes beyond the control of the promoter, which corrupt or affect the administration, security, fairness or integrity or proper conduct of this promotion, the promoter reserves the right to disqualify an individual who tampers with the entry process, take any action that may be available, and to cancel, terminate, modify or suspend the competition, subject to government legislation. 24. If your entry is selected as a winning entry, validation of your circumstances, the validity of your entry will be undertaken by the promoter. Method of validation will be determined by the promoter at complete discretion. If the winning entry is deemed to be a winner, the winner will be notified as per the terms and conditions. (b) subject to any written directions from a regulatory authority, to modify, suspend, terminate or cancel the promotion, as appropriate, subject to government legislation. 27. All entries become the property of the promoter. The promoter collects personal information about you to enable you to participate in this promotion. 28. The promoter shall not be liable for any loss or damage whatsoever which is suffered (including but not limited to indirect or consequential loss) or for any personal injury suffered or sustained in connection with any prize/s except for any liability which cannot be excluded by law. The promoter is not responsible for any incorrect or inaccurate information, either caused by the entrant or for any of the equipment or programming associated with or utilised in this competition, or for any technical error, or any combination thereof that may occur in the course of the administration of this competition including any omission, interruption, deletion, defect, delay in operation or transmission, communications line or telephone, mobile or satellite network failure, theft or destruction or unauthorised access to or alteration of entries. conducting and promoting this competition. For purposes of public statements and advertisements the promoter will only publish the winner’s first name. A request to access, update or correct any information should be directed to the promoter. If you are not willing for this to occur you cannot participate in the promotion. 31. You consent to the use of your answers, in relation to the 10 wedding related questions, to be used for a statistical study for The Maharani Diaries. Please note that at no time will your name or contact information be used in the results published. Only your answers will be used to form a ratio and help to gain useful insights into bride’s spending and the wedding industry.